Kindziuk is a very odd dry-cured meat product, but supposedly very famous in Poland, as well as Lithuania, where it is called Skilandis. Until recently, I never heard about it, but came across the recipe in the Marianski’s Home Production of Quality Meats and Sausages. For starters, I was surprised to see it would traditionally be cured in a pig’s stomach, or bladder. Now I’ve seen sausages cured in pig’s bladders, which are pretty similar to curing in intestinal casing, they’re just bigger and rounder. But a pig’s stomach is a sturdy, muscular organ. In the South of the U.S. it’s called a hog’s maw and can be cooked and sliced into strips as you would most skeletal meats. I've never cured in something so thick and muscular before, and it's something I would like to experiment with. I used to see pig’s stomachs in our grocer’s freezer all the time, but now that I’m in the market they seem to have disappeared. Two weeks and multiple stops later and I was still gutless. So I used a double wrapping of caul fat, as that’s worked in the past. The spicing of Kindziuk is also unusual, but that’s just because they’re not spice flavors I normally associate with dry cured meats or salami. But they were easy to get. I made my Kindziuk spice mixture with marjoram, mustard seed, caraway, bay, sweet paprika, white pepper, and allspice. Grinding the mixture in my mortar, it smelled wonderfully warm, savory, and slightly sweet. The stuffing for Kindziuk is primarily lean beef mixed with pork fat, and I’m very excited to see how it tastes when the cure is done. The recipe states it's traditional to use older animals, which I think also hints at the stronger flavor, and thus a need for heavier spicing. It's also salted at 3.5% per weight, not the usual 2.5-3%. A small increase, but significant. As excited as I am to try this, this is a product that’s going to take a while. It hangs to cure for 6-8 weeks, then gets cold smoked twice, and then hangs to continue to cure. Marianski remarks that this sausage is famous for its keeping abilities – no doubt after such a long and intensive curing session. In researching this product, I couldn’t find any information on it. Well, not in English. I did find this great site from Poland...which is in Polish. In a moment of “it’s a small world,” I realized that this site is the same one Marianski gives photo credit to in his recipe for Kindziuk. Even if you don’t speak Polish, the site is very interesting to check out. The site’s author, Robert Winckiewicz, presses his Kindziuk, which is something I’ve wanted to try for a while. A major principle of the Marianski’s book is that you shouldn’t be tied to recipes, as you’ll often encounter situations requiring you to improvise. In these instances, it’s more important to understand how and why curing meat works, so you can adapt your recipe to produce a safe, quality product. In that light, I decided to press my Kindziuk as well, since I thought the caul fat could use some reinforcement during the initial curing period to form a tight seal. So now the Kindziuk is starting its initial cure, although I’m still on the lookout for a pig’s stomach to try on Kindziuk batch #2. One thing I may try differently with batch #2 is using pork belly for the fat, instead of back fat. I saw that on Winckiewicz’s Polish site and thought it was very interesting. I’ve had dry cured pork belly before, sliced thin and enjoyed raw like prosciutto, but in general pork belly is not in dry cured in salami. Unlike the firm, dense back fat of a pig, pork belly is soft and smushy, so once ground up it can tend to smear and actually seal moisture in a salami casing, causing it to hold water and rot, rather than cure. I like the comment about not sticking too close to recipes, and being able to improvise. But how do you ensure that the curing process hasn't gone bad somewhere? Thanks for the comment - it's a great question. I think it's important to remember that you can alter a recipe, but you always need to maintain the same principles of setting up barriers to pathogens and spoilage. Nature is never precise, so when presented with any animal cut, you need to maintain a high level of sanitation and attention to details. So that involves keeping track of your final weight so the salt levels are correct, making sure your curing cultures are still viable, and continued cleanliness from start to finish. So by all means you can play around with a basic recipe, altering spices, adding a few hours smoking time, substituting lamb or beef for pork meat, etc. But you still need to have a firm grasp of the basic principles for preventing unwanted microbial growth. Hi Tengiz, thanks so much! -Wash it really well to remove any blood or debris. -After washing, pat off the excess water and inspect it for any large fatty lumps or thick bands of fat. With casings these are removed by the packer, but with caul fat you'll need to visually inspect and remove fatty deposits yourself. 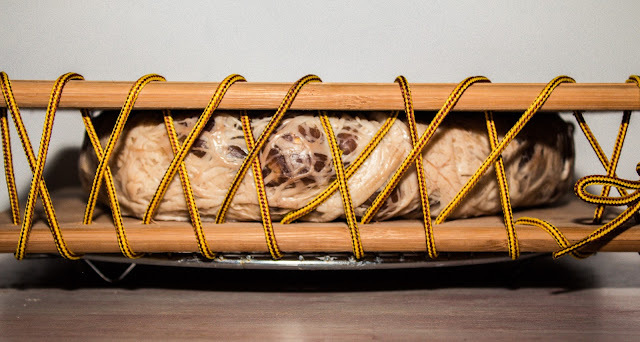 - When it comes time to wrap your meat, you still want to prick the caul fat with a needle or pin all over the surface to help with air and moisture exchange. - I've had a lot of success with curing meat in caul fat, although I always smoke the caul fat wrapped bundles at the start of curing. I find this helps to "seal" up the caul fat and keep the wrapping from coming off. Plus, smoking also lays down a layer of acidic residue that keeps the caul fat free from mold. - Today I just do a thin wrapping of caul fat, but with this Kindziuk I wanted to replicate the thick casing of a pig's stomach. 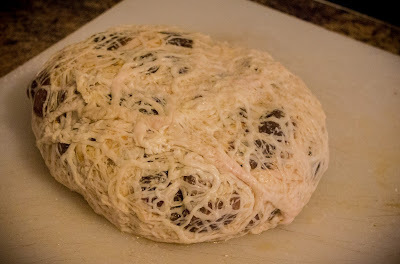 Since I used so many layers of caul fat, I did put down a light dusting of salt on the caul, so the many layers of caul fat would not pull the salt from the ground meat in the center of the wrapping. I hope this helps, but let me know if you need more info! No problem! It should be fine - just make sure it's clean to start with and trim off any lumps of fat. Best of luck with your curing!